The latest nor’easter — which would be the fourth winter storm to hit New England this month — could “affect mostly Downeast and East Central portions of [Maine] with some snow and wind Wednesday night into Thursday,” according to the National Weather Service. 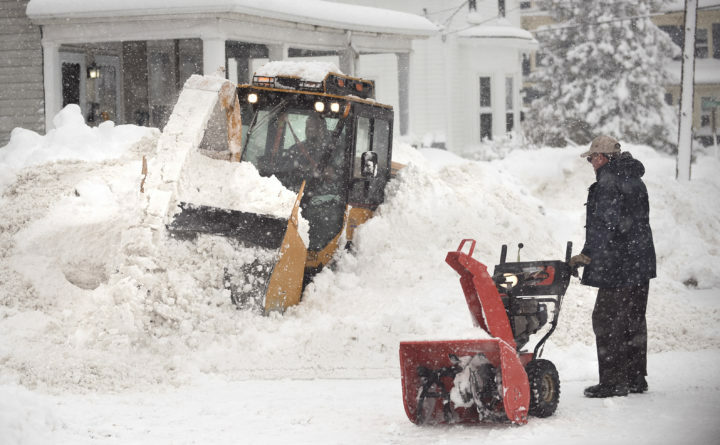 Unlike the snowstorms that passed over Maine on March 8 and on March 13 and 14, the approaching storm is not expected to leave behind a large amount of snow. As of Monday evening, the weather service was predicting 2 to 4 inches of snow for the Bangor and Portland areas and along the eastern coast. Midcoast Maine could get 3 to 5 inches, while areas further inland,to the west and north, could get 1 to 3 inches. “The storm track remains highly uncertain,” forecasters in the weather service’s Gray office wrote in a statement. Mark Bloomer, a forecaster in the weather service office in Caribou, said Monday that how much snow could fall depends on how far the storm is off the coast as it heads northeast. Any snow that does fall would add to what has been an above-normal snowy winter for Maine, Bloomer said. So far this month, Bangor has gotten more than 32 inches of snow, which is about 25 inches more than normal for March, he said. Since Jan. 1, Bangor has gotten 108.5 inches of snow, which is 50 inches more than normal this far into the calendar year.